Epa has been promoted to Sotamies (stm) and assigned to the 2nd Squad, where he has been tasked with the role of an AT rifleman. Congratulations! A platoon inspection was held today in order to celebrate the Finnish Independence Day. Afterwards the platoon attacked against an enemy base and successfully captured it with only light casualties. Vääp Sami was promoted to Vänrikki (vänr). Kers Raunhofer was promoted to Ylikersantti (ylik). Alik Jarger was promoted to Kersantti (kers). Korpr Strat was promoted to Alikersantti (alik). Stm HaBa was promoted to Korpraali (korpr). Yliv Blake and kers Jarger were awarded with the Ribbon with a Silver Wrench for their continuous work to deliver high-quality missions for LDD Kyllikki. Kers Kuokkanen and alik Hawk have been awarded with the 10-year Service Ribbon. In addition, the following members were awarded with a Kuntoisuusloma (KL): Broileri, KuiK, Stellar, Kassu, Naatti, CZ, Mika, Lufti, Spinoza and Remareiska. Csharp has been recruited to the detachment. Welcome! Epa has been recruited to the detachment. Welcome! Poppius has been promoted to Sotamies (stm) and assigned to the 2nd Squad, where he has been tasked with the role of an AT rifleman. Congratulations! 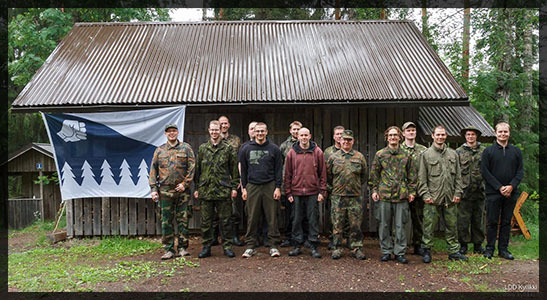 A squad meeting was held in northern Ylöjärvi at a lake cottage, deep in the forest. Dodging impaling stakes in the peatbath, throwing darts and sitting by the fire were included in the program. Alik Jarger received the Pro Kyllikki (PK) medal. Alik Jarger has continuously supported the detachment with maps and tactics guides. His editor school has also helped others understand the potential of the editor tools in Armed Assault. 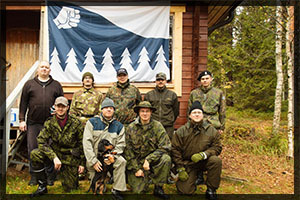 ylil Psykoisi, yliv Broileri, vaap Sami, kers Kuokkanen, alik Stellar, alik Jarger, korpr Hammer, korpr Scottz and stm Sakinz were awarded with Talkootyön Ansiomitali (TA). Due to rather dissatisfying ARMA 3 island release, LDDK command has decided to send a commando unit consisting of 4-5 men to Prague, Czech Republic in midseptember to guarantee a proper release of the game. The unit will operate in Prague and its vicinity and will most likely infiltrate the local booming brewerybusiness to mask it´s operations. Recon operations will likely take part also in the Lesany region. Poppius has been recruited to the detachment. Welcome! Today we can proudly reveal the newest creation of an LDD Kyllikki member: the Caribou Frontier. Created by Raunhofer, Caribou Frontier is a new terrain for ARMA 2. The terrain will be officially released 18 Aug 2013, but LDD Kyllikki will have its first official visit to Caribou Frontier with Anrop this Friday. Now that ARMA 3 is right behind the corner, it is a good time to push ARMA 2 further and do some experimenting with the game and its mods. Last Friday LDD Kyllikki played its first official Advanced Combat Environment 2 game in a long time. The mod seemed solid and enjoyable. Therefore LDD Kyllikki is taking a step towards ACE2. We have already updated ACE2 to our Server 1, and we will also transform our organization to an official ACE2 detachment in ARMA 2. Following the ARMA 3 beta release, LDDK took the current release to a serious test with 26 players. Supported by a midget submarine and an armored fighting vehicle, the infantry assault against a coastal village in western Stratis was a success. The platoon managed to free a captured US POW with marginal casualties of 21 men. 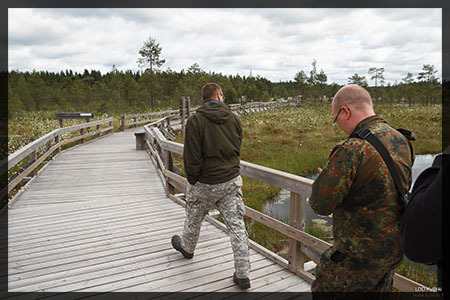 A squad meeting was held in Seitseminen National Park last weekend. Activities included long-range patrolling, grand strategy planning, shot put and poetry reading. Changes were made to Kyllikki's command structure as majuri Broileri resigned his commission as commanding officer after 10 years of service. LDDK wishes to extend its gratitude to Broileri and is happy to see him still serve the detachment as ylivääpeli in the Recon Team. Ylil Psykoisi is LDDK's new commanding officer. Vääp Sami is LDDK's new executive officer. Kers Raunhofer will be acting first sergeant. Alik Charlie Frank was promoted to kersantti (kers). Psykoisi, Broileri, Blake, Kuik, Kegetys, Kuokkanen, Charlie Frank, Stellar, Jarger, Ukkapukka, Naatti, Spinoza, Scottz, CZ and Haba were awarded with Talkootyön Ansiomitali (TA) for participating. The detachment held its traditional inspection on the Finnish Defence Forces Flag Day. Alik Sahuri was promoted to Kersantti (kers). Korpr Hawk was promoted to Alikersantti (alik). Stm Mika was promoted to Korpraali (korpr). Stm Scottz was promoted to Korpraali (korpr). Alik Kassu was awarded with Kuntoisuusloma (KL) for providing the detachment with training material. In addition, Kuntoisuusloma (KL) was awarded to kers Raunhofer, alik Jarger, korpr Rölli, korpr Strat, korpr Ukkapukka, stm Haba and stm Sakinz for exemplary service. Remareiska has been promoted to Sotamies (stm) and assigned to the 2nd Squad, where he has been tasked with the role of an engineer. Congratulations! Several veteran members of LDDK have today been awarded in recognition of their long and active service. Maj Broileri, ylil Psykoisi, yliv Blake, ylik Kuik, kers Night, alik Stellar, korpr CZ, korpr Ukkapukka, and stm Mika have been awarded with the 10-year Service Ribbon. Vääp Sami, ylik Winters, kers Kuokkanen, alik Charlie Frank, korpr Hammer, korpr Hawk, korpr Naatti, and korpr Spinoza have been awarded with the 5-year Service Ribbon. Alik Sahuri, korpr Hawk, korpr Naatti, and korpr Ukkapukka for surviving the campaign: Operation Bakery Service Ribbon with the Stars and Oak Leaves. Ylik Kuik, kers Night, kers Raunhofer, Ylik Winters, alik Charlie Frank, alik Jarger, alik Karko, alik Stellar, korpr CZ, korpr Lufti, korpr Rölli, stm Haba, and stm Scottz for taking part in every combat mission: Operation Bakery Service Ribbon with the Stars. Maj Broileri, ylil Psykoisi, vääp Sami, kers Kuokkanen, korpr Hammer, korpr Kassu, korpr Nouty, korpr Strat, stm Gladd, stm Mika, stm Paddington, and stm Sakinz for taking part in most combat missions: Operation Bakery Service Ribbon. In addition, korpr Kassu has been promoted to Alikersantti (alik). Alik Kassu will take the role of the 2nd-in-command of the 2nd squad under ylik Kuik. Arto has been promoted to Sotamies (stm) and assigned to the Heavy Weapons Team as a rifleman. Congratulations! Remareiska has been seen fit to join the ranks of LDDK. Welcome! Bohemia Interactive's new tactical shooter ARMA 3 is coming! Welcome to test ARMA 3 Alpha with LDD Kyllikki. Join #kyllikki IRC-channel @ quakenet to find out the server's password. The traditional squad meeting of the winter season was held last weekend in the small town of Kannus, Western Finland. Charlie Frank, Broileri, Night, Kuokkanen, Raunhofer, Jarger, Lufti, Rölli, Strat, Paddington and Scottz have been awarded with the Talkootyön Ansiomitali (TA) for participating. Arto has been recruited to LDDK. Welcome! LDD Kyllikki wishes happy new year! LDDK wishes everyone a very Happy New Year 2013!